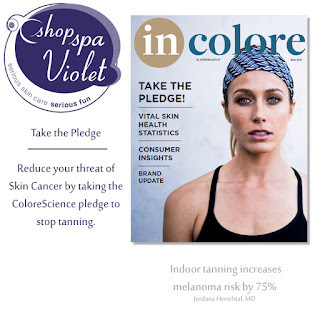 shopspaViolet is Serious Skin Care, Serious Fun: Take the Pledge! Simply because your skin is not burning does not mean aging or cancerous cells are not lurking. "Did you know that skin cancer is the most common cancer in the United States ? And exposure to UV light from the sun and tanning beds is the most preventable risk factor for skin cancer", says Allison Arthur, MD. "Stop tanning outdoors and indoors. Indoor tanning increases melanoma risk by 75%", says Jordana Herschtal, MD. People who use a tanning bed before 35 increase the risk of melanoma by 75% and may be responsible for over 170,000 cases of non-melanoma skin cancers in the U.S. according to a 2012 study. Environmental Hazards for your Skin! Do you do Regular Skin Exams?! Sunscreen all Day, Every Day!